Objectives: To assess the complications associated with gastric band. Methods: A retrospective analysis was performed using longitudinal data from adult patients who received LAGB between Jan 1, 2000 and Feb 29, 2008. General complications, (bowel obstruction, hernia, dehydration, gall bladder, and pain) as well as band-related complications (erosion, slippage/prolapse, device malfunction, intolerance/removal, and port-related issues) were reported for all patients undergoing surgery. Death and re-operation for weight gain (LAGB followed by either a second band insertion or gastric bypass), were also reported. 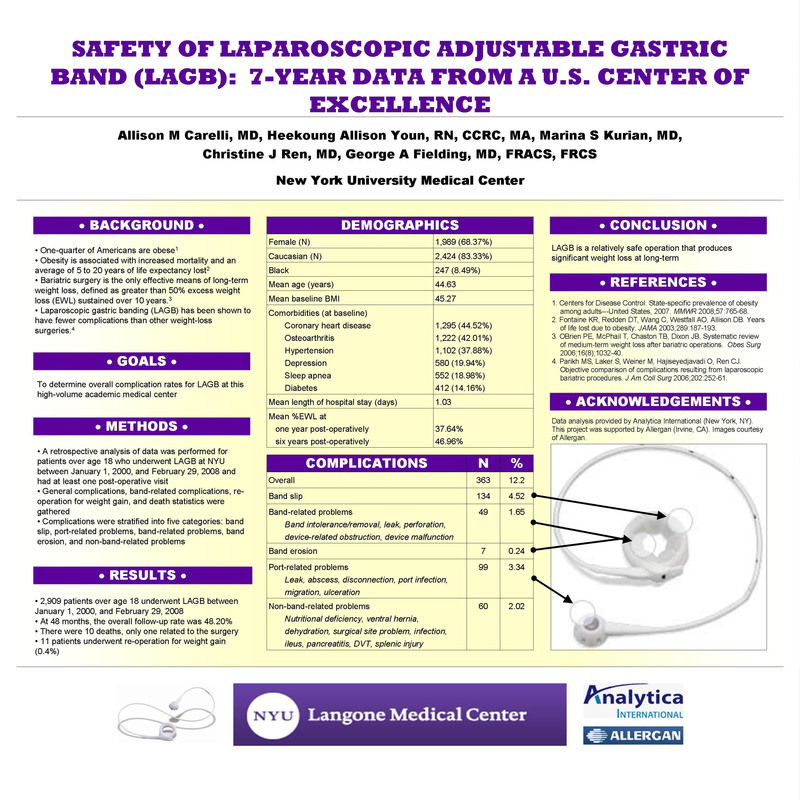 Results: Mean EWL of 53% was achieved at 3 years post-surgery and sustained over time by LAGB recipients with at least 1 record of postsurgical weight (n=2,909). Of the 2,965 patients who received LAGB during the study period, 363 (12.2%) experienced 1 or more complications. The most common complications were band slip (4.5%) and port-related problems (3.3%). Other complications were rare (Table); only 7 (0.2%) patients had band erosion. Nine (0.3%) deaths unrelated to surgery, 1 (0.03%) death related to surgery, and 11 (0.4%) re-operations for weight gain were reported. Conclusions: LAGB patients in this 7 year study achieved substantial and sustained weight loss, with few major complications.